To play, the character cards are laid out and then the inventions or gadgets are randomly placed on the character cards. The learners can then select which character/invention pair for which they would like to design. TJ selected a hover chair for an astronaut. Sebastian selected a communication device for a fairy. Will selected a drink carrier for a wizard. This activity was a high interest, high engagement, high yield instructional task. Some learners had a little trouble getting started but once they did, their designs and inventions were fantastic. I think the fanciful nature of the cards helped engagement. The company has a free app to go along with their set for the designs to be uploaded and described. This app did not do what was promised so I cannot recommend its use. Randomly choose one or more items from A and one or more items from B, C, D or E and get busy. I use the following activities to introduce elementary students to the design thinking process. The ultimate goal is for the learners to work on their own, self-selected problems in which they will apply the design thinking. The goal of this activity is to have learners practice a simple version of the engineering design process. In teams of 3 to 4 members, learners are asked to build the highest tower out of 50 small marshmallows and 50 spaghetti noodles. After brainstorming and sketching possible designs, learners begin the process of building this spaghetti-marshmallow towers. After some time prototyping, a time-out is called so learners can reflect on what is working and not working. Learners are encouraged to see what the other groups have created to spark new ideas. 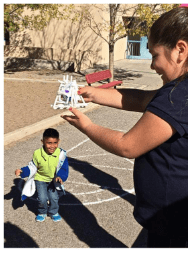 The second part of the introducing elementary-level learners to the design process is introducing them to empathy and its connection to the design process. To have learners discover and explore the elements of empathy as it relates to design. What do you think your egg is feeling about his or her upcoming drop? What do you need to make your egg’s journey less stressful? What can you do to reassure your egg that everything will work out okay? What forces do you need to consider in order to keep your egg safe? Consider gravity, rate of descent, impact. Create a Gamibot – http://www.howtoons.com/?page_id=3475. With available art materials, decorate the Gamibot. Create an Environment for the Gamibot Out of Natural and Art Materials. Make sure it fits your Gamibot’s backstory creating an environment that is tailored for your Gamibot. Be ready to explain why it fits your Gamibot. To put everything together by creating a design for another human being. Learners design a squishy circuit product based on the specifications given to them by a classmate – the client from all of the available colors of Play-Doh (conductive clay), modeling clay (insulating clay), and LED lights. As partners, decide who will be the designer and who will have a product designed for him or her – the client. What color Play-Doh? Modeling clay? LED lights. Construct the design while your client gives you feedback. The client is not permitted to touch the Squishy Circuit during the design process. After completion, roles are switched. Understanding learning as a process; the how-to’s of learning. Knowing how and where to search for resources, people, information when needed, also known as just-in-time learning. Being able to make social, intellectual, interest-driven, and academic connections both face-to-face and virtually. Adding to current fields of study, knowledge bases and content areas through giving feedback, sharing resources, creating content. Design thinking has great potential to aid both educators and learners in developing these 21st century living, learning, and playing skills, Many, including the Stanford’s d-school, are working towards integrating these ideas into educational settings to help insure that education is more aligned with real world skills and needs. This movement to build a generation of design thinkers could not be more timely or more relevant. We are living in an age of increased complexity, and are facing global challenges at an unprecedented scale. The nature of connectivity, interactivity, and information is changing at lightening speed. We need to enable a generation of leaders who believe they can make a difference in the world around them, because we need this generation to build new systems and rebuild declining ones. We need them to be great collaborators, great communicators, and great innovators (Design Thinking in Schools: An Emerging Movement Building Creative Confidence in our Youth). The intent of this article is to motivate educators in using design thinking to approach their instructional strategies and curriculum from a fresh perspective; to learn and promote skills, attitudes, and knowledge that are more specific for their students as well as having them develop skills for being learners for this era of time both in and out of school. Every day you design ways to interact with your students around content. You can follow a design process to be more intentional about connecting this content to the interests and desires of today’s learners by finding out more about the things that they do outside of school and connecting that to the content you are bringing to them (Design Thinking for Educators). So simply put, when implementing the design thinking model, the educator approaches his or her learners with the question, “What and how do you want to learn, and how do you want to demonstrate your learning?” and then uses the process of design thinking with his or her learners as co-creators to develop the curriculum and learning activities specific to their interests, desires, and needs. How can the educator use design thinking principles to inform instructional and curricular decisions? How can the educator include their students in creating a learning environment informed and influenced by design thinking? The first and most important step in the design thinking process is knowing and empathizing with the audience, in this case, the learners. Learning activities such as interviews, learning surveys, get-to-know one another activities, and empathy development are used so the educator gets to know the students; students know the educator; and the students know one another. This is crucial step so that instruction and curriculum can be selected and tailored for each specific student group. The focus is on processes – producing, assessing, developing, creating, revisiting, revising. Learning content becomes secondary to developing the how-to skills for how to be a learner in the 21st century. For more on this see, Focusing on the Process: Letting Go of Product Expectations. Ambiguity is normalized and failure is seen as iterative. For more on this, see Reframing Failure as Iteration Allows Students to Thrive. Group skills for design thinking include active listening, collaboration, conflict management are integral for the process. Participatory, democratic, inclusive principles and methods guide decision-making. Design thinking honors all voices; acknowledging that everyone – educators and learners alike – have valuable input into the design, implementation, and assessment of the learning activities. Continuous feedback loops for and by the educator and the learners help inform the process. Feedback or assessment is not a separate step or entity as is typical in the classroom. The educator and learners engage in continual evaluation of the efficacy of the learning activities through group discussions, writing, informal assessments, making revisions, alterations, and detours based on this feedback. Deep reflection is part of the process. Related to continuous feedback is building into the process the skills and attitudes of being a reflective practitioner. This permits both the educator and learners to take a step back to analyze what is working and not working within and throughout the design process. The curriculum becomes tailored to the student group being served. Because the focus and intention is on tailoring learning to the student group as well as individual students, differentiated instruction and universal design for learning become inherently and naturally part of the process. The educator and students learn the process to address ambiguous problems and concerns. The result is the development of tolerance for and skills to address ambiguous problems which is more aligned with how the real world works. The educator and students develop skills related to innovation, creativity, critical thinking, problem solving – those skills valued by today’s workforce and society. Pfau, P. (2014). Rethinking Education with Design Thinking – http://www.metropolismag.com/Point-of-View/February-2014/Rethinking-Education-with-Design-Thinking/. Teachthought. (2013). 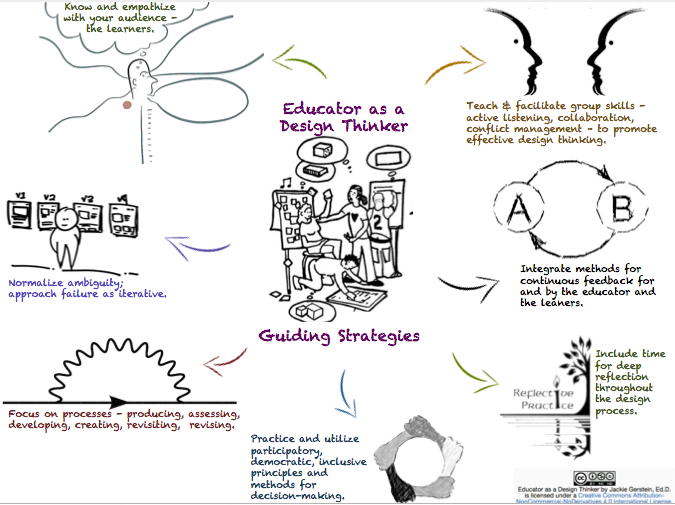 45 Design Thinking Resources For Educators http://www.teachthought.com/teaching/45-design-thinking-resources-for-educators/. I have a fitness teacher. She knows fitness, she knows how the body works. She knows how to break down the exercises and how to teach them. What she doesn’t know is each participant’s body. She assumes she knows what is best for all of the students. In other words, she lacks empathy for those in her class. Some tolerate her, others do not go to her class because of her lack of empathy for her students. But these are adults, children in public school education do not have such a choice. So this post is a call to action to highlight and become intentional in bringing teacher empathy into the classroom. Empathy isn’t sympathy- that is, feeling bad for someone else. It is feeling with someone else, sensing what it would be like to be that person Empathy is the ability to imagine yourself in someone else’s position and to intuit what that person is feeling—to stand in their shoes, to see with their eyes, to feel with their hearts—it is a stunning act of imaginative derring-do, the ultimate virtual reality, climbing into another’s mind to experience the world from that person’s perspective. Good teachers don’t approach a child with overzealousness or with destructive conscientiousness. They’re not drill-masters in the military or floor managers in a production system. They are specialists in opening small packages. They give the string a tug but do it carefully. They don’t yet know what’s in the box. They don’t know if it’s breakable. Empathy for one’s students should be a top concern of educators and intentionally used as a primary instructional strategy. The learning is the center of our world, not the teaching. And until we see that we are in the business of designing and causing learning instead of merely in the business of teaching, we will fail to cause optimal learning. Great care has been given to thinking through the goal of the learning and the conditions that have to be in place if optimal engagement and active learning, in a group of diverse students, is to occur. Many describe empathy as the first step of effective design thinking. “One of the core principles of design thinking is its focus on human values at every stage of the process. And empathy for the people for whom you’re designing is fundamental to this process” What is Design Thinking? 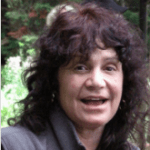 I would go as far as saying that empathy is necessary for designing all facets of teaching: setting up the classroom, selecting curriculum, choosing and implementing classroom management strategies, and teaching each individual learner as unique individuals. Foundation of the teacher-student relationship: With educator empathy, the learner feels as though the educator has a genuine interest in and really understands him-her. Individualized, differentiated, and personalized education: There is absolutely no way an educator can tailor instruction to the meet their learners’ needs, interests, desires without empathy. 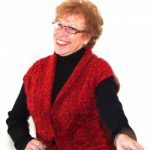 Meeting the social emotional needs of the students: “Addressing the host of unmet social and emotional needs that students carry into the classroom demands that teachers be able to look below the surface and understand what’s driving a particular set of behaviors” (Unleashing Empathy: How Teachers Transform Classrooms With Emotional Learning). Modeling empathy to increase empathy by the learners: When educators walk the talk of empathy, students can see empathy in action and develop those skills for themselves. 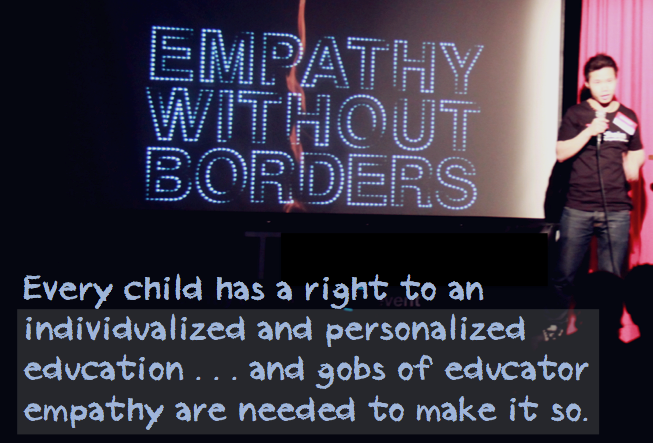 ‘Ultimately, creating empathy comes down to leading children by example. 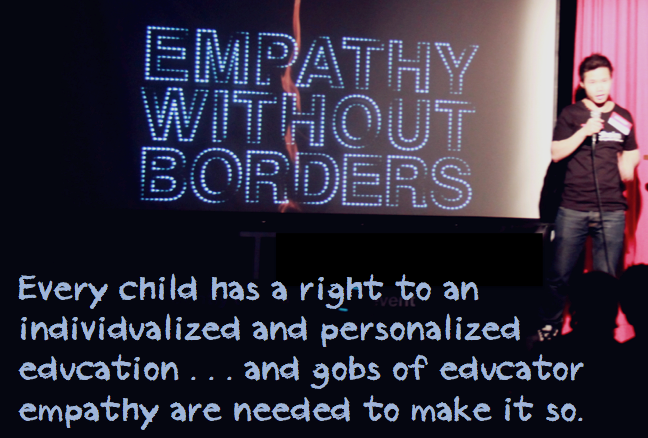 “We have to model what we want them to do”‘ (Creating Empathy in the Classroom).